Ada Recinos was appointed to the Richmond City Council in September 2017 to fill the seat left by former mayor Gayle McLaughlin when she announced her run for California lieutenant governor. Recinos earned her bachelor’s degree from UC Santa Cruz and would be the youngest Richmond City Council member ever elected. She will be running for her seat in this year’s election as a Latina who has put together six years of experience organizing marginalized members of the community. She did this while advocating for their rights, socially and civilly. Recinos has also gained experience by serving previously on the Richmond Human Rights and Human Relations Commission. Her platform includes partnering with small businesses and entrepreneurs in the 23rd Street area, improving the economics of the city while investing in local artists/art to showcase the talent in Richmond. She also hopes to increase the minimum wage of Richmond workers in order for them to achieve a livable wage, which, in turn, would help the housing situation and the displacement of many in the area. Demnlus Johnson III is running for Richmond City Council on the Nov. 6 ballot. Currently he is vice chairperson of Richmond’s Economic Development Commission and a community worker at Richmond High School. He also is a member of the Citizens Police Review Commission. Johnson also serves as a Town Hall Moderator for Richmond Ceasefire. “I work to better the relationship between Richmond police and civilians through working to build respect, trust and understanding,” Johnson said. According to votedemnlusjohnson.com, Johnson grew up in the Iron Triangle area of Richmond and after high school attended Howard University in Washington D.C. While growing up in the Iron Triangle, he said he learned how important economic justice and community engagement is for the success of the community. He also witnessed how its absence is detrimental to people’s lives. Johnson partners with various community organizations to eliminate barriers in academic and social success for youth in the community. He wants to join the city council to help keep Richmond moving forward in a manner that respects the citizens and their heritage. Johnson said he understands issues of wealth, economics, education and social mobility. “If we are to truly transcend (barriers) we must aggressively attack them at their root and nourish fertile ground in Richmond,” Johnson said. David Schoenthal is running for Richmond City Council and has lived in the city for the past 16 years. He is the sales director for a company that provides businesses access to law firms and is currently the president of the Point Richmond Neighborhood Council. In the past, Schoenthal sat on the city’s Economic Development Commission and the mayor’s community fund. The candidate said he strives to bring together community members so they can be a part of the city government’s decision-making process. Regarding the city’s social and economic development problems, he believes that a collaborative effort between the public and private sector will solve the housing and development problem in the city. He will also fight for affordable housing and jobs where current and prospective businesses hire local people. Longtime local politician Jim Rogers is running for Richmond City Council in the Nov. 6 election. His plan is to hire more certified law enforcement officers and put new anti-crime outreach workers on the streets. Rogers also wants to improve pothole repairs, and, as an attorney, he said he has proven he can work with his council colleagues. A man of his convictions, Rogers is independent and promises to get down to the root of Richmond’s problems and find meaningful solutions. Rogers is a UC Berkeley graduate and part of the Richmond anti-drug task force. He is also a chairperson for California Common Cause. Rogers has worked to save schools from closing in Richmond, including John F. Kennedy High School, Grant Elementary School and Olinda Elementary School. As a public-school parent himself, Rogers is concerned with the direction of Richmond’s classrooms. Rogers is a PTA vice president and his daughter is currently in second grade He said, “I’ve always put kids first.” Rogers said he has helped eliminate cigarette and alcohol billboards near schools and wants to crack down on street corner drug dealers and crime-ridden liquor stores. He has also campaigned to put a stop to poor El Sobrante developments and also wants to save the dog park at Point Isabel. Cesar Zepeda is running for Richmond City Council and believes that it is important to give back to the community that shaped his outlook and opportunities. Zepeda grew up in Richmond and San Pablo. He attended Walter T. Helms Elementary and Richmond High School before moving on to Contra Costa College. Zepeda co-founded Richmond’s first LGBTQ organization, Rainbow Pride, and serves on several non-profit boards and organizations, including the Contra Costa College Foundation. Zepeda works as an analyst and broker at Aon, an insurance firm in San Francisco. When not volunteering at a community event, Zepeda can be found around Richmond with his dogs Zasha and Zoe. The 86-year old Texas born, Richmond-raised Nathaniel “Nat” Bates is running for re-election for a ninth term on the Richmond City Council. As a two-time mayor of Richmond, Bates has been intertwined with the rich and tricky history of the city since he moved here in the1940s. He was a star athlete during his days as a Contra Costa College student in the 1950s. Bates’ top priorities this time around are to balance the city’s budget, continue work on the city’s public safety issues and the development project at Point Molate. This year’s city council race is a tight one as three seats are up for grabs, with some political newcomers making an impact on the campaign trail. Bates is still one of the favorites to retain his seat, but this may be his toughest battle yet. He is the longest enduring politician in Richmond’s history and will be tested by a new era of politicians on Nov. 6. Vinay Pimple is a Democratic candidate running for one of three open Richmond City Council seats on Nov. 6. Pimple immigrated to the United States from India in 1993 and became a Richmond resident in 2010. He has a law degree from UC Berkeley and experience as an attorney, teacher and software engineer. He is also responsible for the creation of the, Chevron backed, Contractor Resource Center. It is a project that helps small businesses bid on high value contracts in construction and other businesses. Pimple has approved the building of 450 affordable housing units in Richmond and supports the Central Avenue affordable housing project. Campaign finance reform and a plan to get big money out of politics are on Pimple’s legislative agenda. He said money in politics creates an unfair advantage along socioeconomic lines. Personal Carbon Trading Markets are an economic solution he sees for citizens. This plan can supplement income and in turn help combat global warming. Pimple is endorsed by the Contra Costa Democratic Party and California Democratic Party. 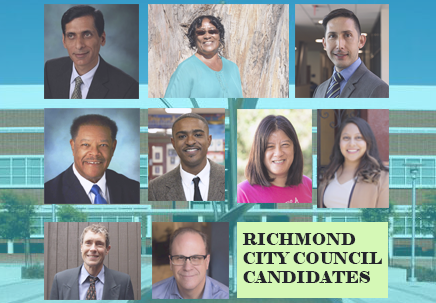 One of Richmond’s most recognized and respected community leaders with a 23-year track record, Diego Garcia, is running for Richmond City Council on Nov 6. Garcia’s record of accomplishments spans community service, education, violence prevention, civil rights and youth recreation. Garcia grew up in Richmond and has been a resident ever since. He is a family man, an experienced businessman and a dedicated volunteer and proven leader. Over the years, Garcia has supported many youth programs and city commissions. At age 20, Garcia was hired by the Communities in Peace program, funded by the California Wellness Foundation, to work with underprivileged students in North Richmond. The businessman has been involved in the Richmond community since 1995 when he started a grassroots organization in Easter Hill, one of the toughest neighborhoods in Richmond. He has worked on programs with the Richmond Police Department and the West Contra Costa Unified School District. In 2005, Garcia established a food drive that has grown into an annual Thanksgiving event, which feeds more than 400 families. In 2009, Garcia was certified by Contra Costa and Solano counties as a gang expert and in 2016, he visited a town in Mexico and renovated a soccer field for its community. Eduardo Martinez is currently a member of the Richmond City Council and is running for re-election on Nov. 6. The former teacher of 18 years in the West Contra Costa Unified School District has served on the council for four years. After unsuccessfully running for a seat in 2010 and 2012, he secured that seat on the city council in 2014. Martinez was born in Dumas, Texas and moved to the Bay Area in the 1970s. He is a part of the political group Team Richmond, a progressive alliance with Melvin Willis, a Richmond mayoral candidate, and Ada Recinos, also a candidate for city council. According to Martinez’s Team Richmond candidate statement, he is in favor of expanding projects on renewable energy, defending homeowners’ rights, and defending public education programs. Martinez is also in support of Proposition 10, the contentious initiative on rent control. For Virginia Ramirez, this is her first time running for Richmond City Council. As an independent, Ramirez said she will be focusing on affordable housing and Richmond’s structural maintenance. According to Richmond.ca.us Ramirez said, “I believe in my community and its potential to create economic change while continuing its social justice work.” Ramirez is an immigration legal assistant for Catholic Charities of the East Bay in Richmond and her platform includes advocating for immigration rights. She wants to help fix the housing crisis in Richmond and said everyone should have a stable home. “I’ve noticed that they’re already developing housing on Nevin Avenue and the Marina,” she said. Ramirez has lived in Richmond for 20 years and received her bachelor’s degree in social welfare from UC Berkeley in 2012. Ramirez said she comes from a Mexican family that believes in humility and hard work. Originally from San Francisco, Carole Johnson moved to Richmond in 1996. She earned her bachelor’s degree in criminal justice in 2008 and her paralegal certificate in 2010, both from San Francisco State University. She is a former Contra Costa College student. After the gun-related deaths of two of her cousins and a good friend from CCC, Johnson began collaborating with a group of mothers to raise awareness about gun violence. For three years Johnson served as the West Contra Costa County chapter president of Brady Campaign to Prevent Gun Violence. She also represented a similar organization in San Francisco, which conducted outreach to inmates at San Francisco County jails and at San Quentin State Prison. Since 2011, Johnson has been active with Richmond Ceasefire, Richmond Homeless Task Force, Alliance of Californians for Community Empowerment and the Contra Costa Racial Justice Coalition.